144 pages | 16 B/W Illus. There are billions of internet users in China, and this number is continually growing. This book looks at the various purposes of this internet use, and provides a study about how the entertainment-consuming users form into publics through the mediation of technologies in the era of network society. It questions how individuals, mediated by new information and communication technologies, come together to form new social categories. The book goes on to investigate how public(s) is formed in the era of network society, with particular focus on how fans become publics in a society that follows the logic of network. 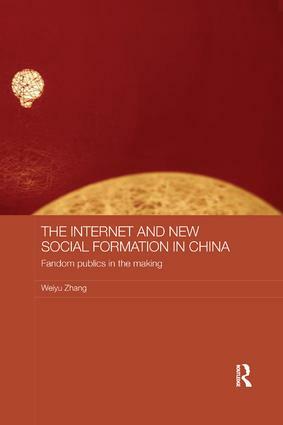 Using online surveys and in-depth interviews, this book provides a rich description of the process of constructing a new social formation in contemporary China. Weiyu Zhang is Associate Professor in the Department of Communications and New Media at the National University of Singapore. The aim of this series is to publish original, high-quality work by both new and established scholars in the West and the East, on all aspects of media, culture and social change in Asia. New proposals are welcome, and should be sent in the first instance to the series editor, Stephanie Donald, at StDonald@lincoln.ac.uk.